I was wondering, briefly, what I would take if I had to pare down my skincare routine right down to its very, very basics. I get lots of people mentioning that I use a wide range of products on my skin, and if I think that’s a good idea, bearing in mind that my skin is quite sensitive. My reply is usually that whilst I do rotate products quite a bit, I tend to stick to tried and trusted favourites, and just swap in one new product into my routine at a time. If you follow me on Instagram at all, you’ll see my morning face routines on the day, and there’s usually a core of products that I use, and only swap one product or so a day. 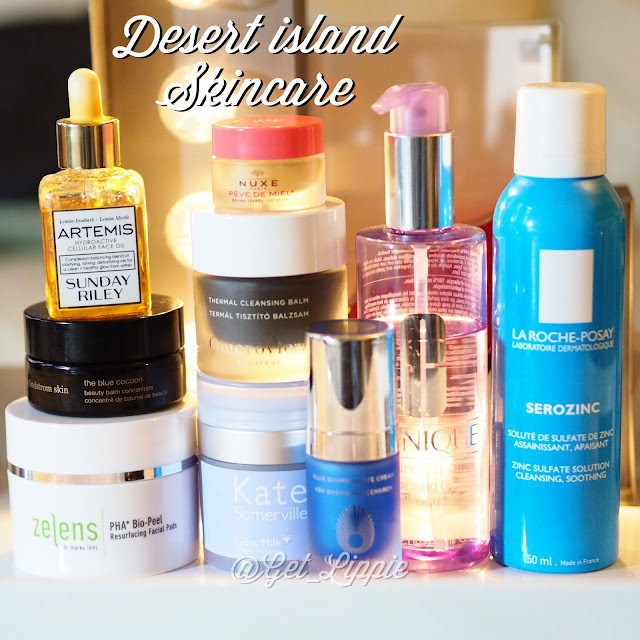 Picking my core, desert island skincare was difficult. Very, very, very difficult.in the end, I narrowed it down to these nine items, and I made them mostly old favourites, because, whilst I’ve trialled some amazing skincare – some that I’m convinced will be future classics, I haven’t been using them long enough to see if they make the “repurchase” hall of fame. All of the products featured here, with the exception of one, have passed that particular hurdle, and in spades. First things first, cleansing. I picked two cleansers, one a basic no frills, no scents, no luxury cleanser, which is perfect for sensitive skin, and also makes a great makeup remover, and that is Clinique Take The Day Off Cleansing Oil. I’ve not reviewed this yet (but I will), but I love it for days when my skin is acting up, and I want something that my skin won’t – can’t – react to. For a cleanser that is the exact opposite, that is luxurious in every single way, smells divine, beautifully textured, and fantastic for a second cleanse, I chose Omorovicza Thermal Cleansing Balm. Follow the link for a full review. Serum-wise, I went with Artemis by Sunday Riley. This was an incredibly difficult choice, and I uhmmed and ahhhed about putting Hydraluron in its place instead. In the end I went with Artemis because it is more of a multi-purpose product, which you can use as an oil or a serum, and it’s anti-inflammatory qualities make it a great product for skin prone to sensitivity or redness, like mine. I’d miss Hydraluron though. I guess you could also call May Lindstrom’s Blue Cocoon a serum, but it’s a balm that turns into an oil, and it’s fantastic for sensitive skin. I use it whenever my skin is flaring up, or when it needs a little extra protection, either from products or from the weather. It’s truly a desert island product in that I can’t imagine life without it. Speaking of balms, the Nuxe Reve de Miel never ever makes it onto my skincare of the day posts, but it is a product I use every single day without fail. It softens the lips beautifully and prepares them for lipstick perfectly. I love the matte texture, and this version, “Love” has a lovely orange flavour, which I like more than the original honey version. And finally, moisturiser. Now, I’m pretty much of the opinion that if you get everything else right, you can use pretty much anything as a moisturiser, to be honest, but I make an exception for this, Kate Somerville Goat Cream. Moisturising, soothing, and also gently exfoliating (it’s packed with lactic acid) this is a moisturiser beyond compare. I can’t wait for Kate Somerville skincare to come back to the UK. I hear rumours that it’s on the horizon, and, as soon as I hear anything confirmable, I’ll let you know. So there you go. If I could only use a few products, these would be the ones I would choose. I think. What skincare products couldn’t you live without? Thanks for this! All your recs duly clocked, though some might still be beyond my wallet – also, I already use Serozinc and the Take the Day Off balm thanks to you and Caroline Hirons. Oh, and Hydraluron sometimes in place of the Olay serum mentioned below. Daily moisturiser – Nivea Light Moisturiser with SPF 15 (winter and dull days). I am on my fifth tube of this since discovering it as I hate the feel of moisturiser and this sinks in immediately and is fine on my eyes and generally silky and compliant, and incredibly cheap. I remember Sali or Lisa (or both?!) saying it is okay to use a cheap moisturiser if you have a workhorse serum doing the biz underneath. Liz Earle Cleanse & Polish (use flannel instead of hot cloth for greater buffability) – my morning go-to cleanser, but not so good for make up so use micellar water or the Take the Day Off.